Humulus lupulus, from the family Cannabaceae (yes, that Cannabaceae). 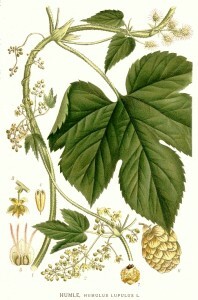 The hops are the seed cone (the hive-looking structure lower right) of the plant. Beer without hops would be, I am told, almost unbearably sweet. Hops add bitterness to the malt with the added benefit of serving as an antimicrobial. DR Futures predicts huge growth in edible hops (i.e. cooking with hops). The stalks can be sautéed like asparagus, made into bruschetta (hops apparently optional according to the recipe), or turned into something called a “fried hop pesto purse.” RIYL jalapeño poppers (extreme fajitas?). “Chocolate covered hops” nets only 31 results on google. A handy descriptor for beer finish, but could find no working examples. Other alternatives, beer with the hops left in. Takery commissioned to mount a PR campaign to familiarize the nation with hops — to make hops as recognizable as apples or bananas. Working feverishly, weeks on end, Takery devises a six-foot tall felt mascot, vaguely resembling a hop cone, more closely resembling a pine cone, sometimes resembling an acorn (depending on the light). Despite no resemblance to a rabbit, dubbed the Hop Bunny (perhaps due to Takery’s natural predilection towards rabbits, for obvious reasons). Astounding variety of hop cultivars available. Takery, on a roll from PR assignment for hops, makes felt mascots for each cultivar. Apollo. Bravo. The venerable Fuggles. And most intriguing of all, El Dorado. Collegiate sports interested in making a 64 (68?) team bracket, pitting cultivar against cultivar. Winners to be determined as a result of complex algorithm involving alpha acid content multiplied by beta acid content.